Psh…Who needs fried, unhealthy, greasy, messy chicken wings?! Preheat the oven to 450°F. Lightly spray a large non-stick baking sheet with oil. Combine the water, flour, and garlic powder in a bowl and whisk until well combined. 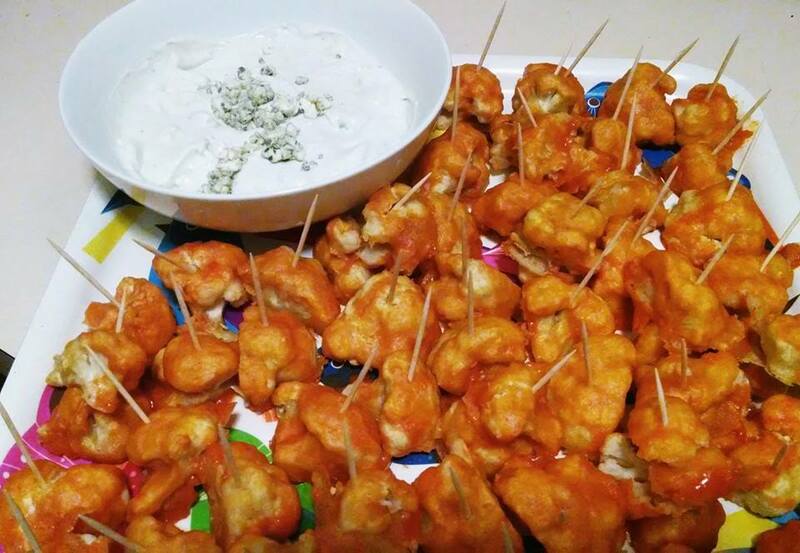 Toss in the cauliflower pieces and mix around (I use my hands…messy but effective!) until completely coated with the flour mixture and place on the baking sheet. Bake for 20 minutes. Pour the hot sauce mixture over the baked cauliflower and continue baking for an additional 5 minutes. Serve the poppers with toothpicks for parties, or in a pile with a spoon for serving. Either way, they will be a big hit with everyone!! And don’t forget to spend a whole minute and a half and make my 90-Second Bleu Cheese Dip!! !